Adventures of Sound Tech Guy: Borderline - Live At The Dow People Place, Sarnia, ON. Borderline - Live At The Dow People Place, Sarnia, ON. Last night, Thursday, June 7th, I was mixing sound for the band "Borderline" at the Dow People Place - Centennial Park - Sarnia, ON. 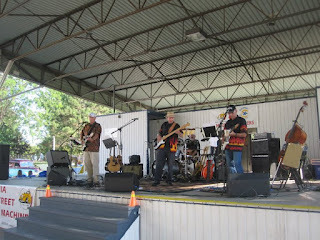 It was great summer weather and a big crowd came out for the music. After a minor technical issue was solved, the show went on. Two quick songs for a soundcheck and we were off and running! Looking forward to the next Borderline gig at the DPP on Thursday, July 5th at 7:30pm. For all of you Sarnia/Lambton folks, why not come on down to the DPP for an evening of great music with Borderline. Admission only costs a Loonie to get it the gates. Hope to see you there next month. Analog Mixing Consoles - Still Relevent?